looking for our retro elf knee hugger ornaments? love vintage retro christmas decorating ideas? 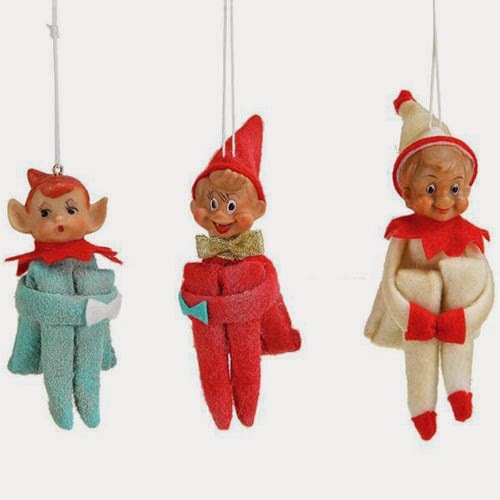 with our vintage-inspired elf ornament knee hugger ornaments fashioned from felted wool, fabric and resin; we've got just what you need. designed and crafted from period-authentic colors, each elf figurine displays an authentic 1960s look for a stylish and distinctively retro-modern look. adorable details such as a gold-colored bow make this christmas ornament set a customer favorite. influenced by antique japanese elf finds; our newly made snow elf ornaments can be used to decorate christmas trees, walls or mantels. price is for a set of 3 (three) elf knee hugger ornaments! they make great holiday gifts too!